Bits of My Own: It is wonderful to have the power on again! It is wonderful to have the power on again! I'm BACK! from surgery, earthquake, hurricane, tornados, floods, etc! August is my least favorite month! And that is during a regular year! This August has been the worst I can ever remember! First of all, I had to have back surgery on August 9th. The initial recovery was pretty gruesome, but I am doing better now. I am finally getting back to doing some stitching again. At first it was just too uncomfortable to sit in one place. We were fairly lucky during the hurricane. We did lose power, and get water in our cellar, but no other major damage. It is hard to look at all the mess, and not be able to clean it up (I still am unable to bend)! We certainly fared much better than much of our hamlet. Parts had to be evacuated, and now they are inundated with water. This includes our post office. The streets are all still closed. I have no idea when we will get mail again! Travel was of course impossible with bridges and the NYS thruway closed. Thankfully outside of our hamlet things are getting back to normal. That said, I actually have a little finish to show. 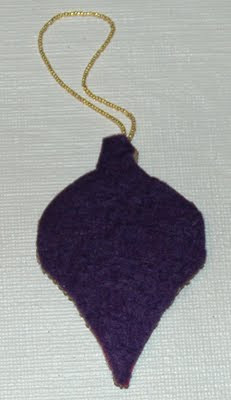 I finished the little Mill Hill ornament Diamond Holiday, from the Christmas Jewels series. I finished the back very simply with some purple felt. Normally I'm not much for beading, and I don't really like to stitch on the perforated paper, but this little ornament just appealed to me. I think if I did it again though, I would substitute some 28ct linen for the paper, perhaps some blue or lavender would be nice. I made a little progress on "And they sinned". Please forgive the wrinkles. It is just too hard to hobble off to use my ironing board! This is a very slow stitch! I have been in that blasted tree forever! I am working on the spotted snake that is crawling through it right now. Lastly is my TUSAL. Here is, showing lots of color! I hope all of you made out ok in the hurricane, and are recovering from that or whatever other crisis you are facing. It's always something. Isn't it? Glad to see you are on the mend and able to stitch a bit more now!!! Definitely take it easy as you continue to heal!! i hope your recovery be fast, and you can move and make all the thing that you want. Your beading ornie is beautiful, sparkling.